Stand up paddle boarding at Mangrove Cay, Turks and Caicos. 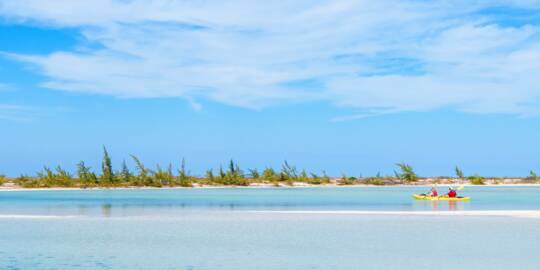 Discover the Best of the Turks and Caicos! Blue chromis and wrasse at the Grand Turk wall. 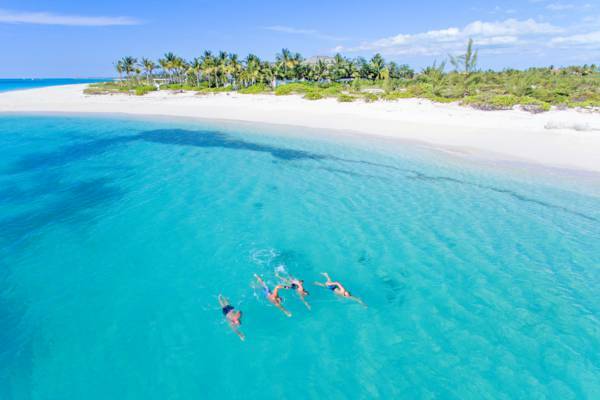 With some of the finest beaches in the Caribbean and Atlantic, it's no wonder that the Turks and Caicos excels as a water sports destination. There’s a perfect ocean activity waiting for everyone. 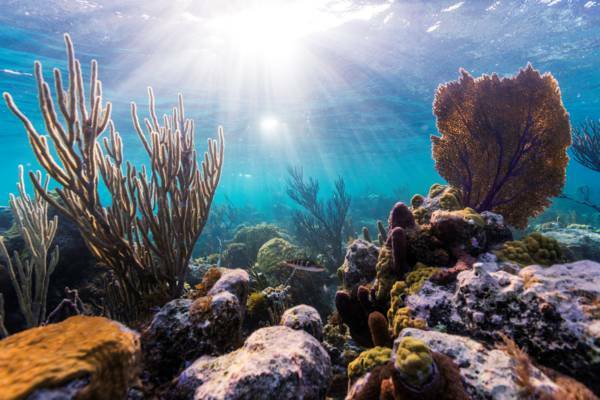 There’s an impressive array of underwater sights to discover in the Turks and Caicos. 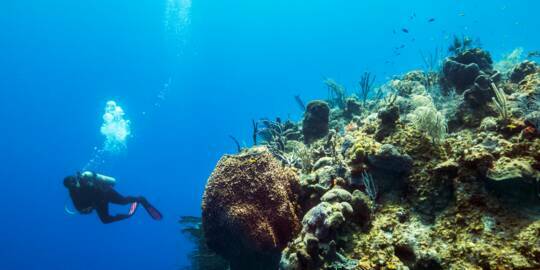 We have a vibrant barrier reef and countless shore snorkelling sites to discover on your vacation. 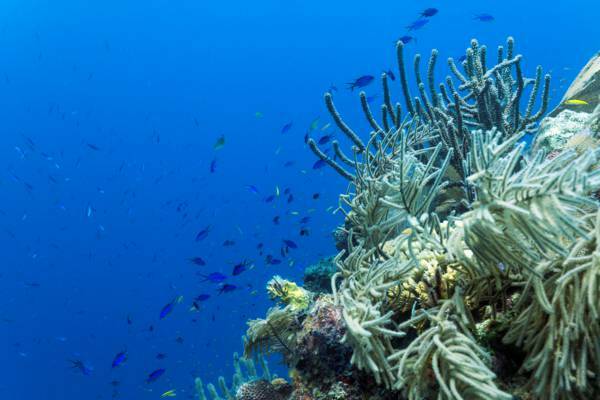 Surrounding much of the Caicos island group and at over 150 miles (240km) long, we actually have one of the largest barrier reefs in the Caribbean. Dives sites across over 80 miles (130km) of the barrier reef are regularly-accessed from Providenciales, so there’s always an interesting underwater location to discover! Turtles, reef fish, stingrays, sharks and dolphins are common, as well as an amazing array of hard and soft corals. The Smith's Reef snorkelling site on Providenciales. The colourful beach and shore snorkelling reefs support tremendous varieties of fish, stingrays, turtles and small creatures. Many animals are masters of camouflage, but if you look carefully you’ll spot snails, octopuses, shrimp, lobsters and flamboyant worms. If you’d rather have a guide when snorkelling, there are plenty of boat excursions and private charters available. Our knowledgeable boat captains will take you to the best reef that the conditions allow for. Boat cruises often combine beach exploration and barbeques with a visit to the snorkel sites, and are great fun for the whole family. Tours often pick up guests on the beach fronting their resorts – a great way to start the adventures! 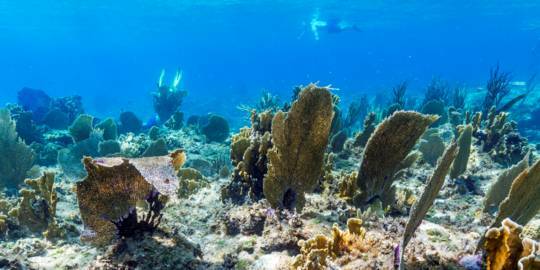 The Turks and Caicos is situated on a submerged limestone plateau, and the edges of this shelf offers some of the best wall SCUBA diving in the Caribbean. In many places, the transition in depth is breath taking, where the depth drops abruptly from 40 feet (12m) into the thousands. Channels and waterways of North Caicos. Due to the country’s marine limestone foundation and general low terrain elevation, extensive and beautiful marine wetlands are found throughout the islands. Many waterways are directly connected to the ocean and are tidal. These sheltered channels serve as a nursery for a plethora of wildlife, including lemon sharks, conch, turtles and birdlife. The best way to see wildlife is in their own environment. There are several ways to enjoy our beautiful eco-systems. Silent and low-impact, kayaks and stand up paddle boards are the best ways to travel through the narrow inlets and creeks. Choose from guided tours, or simply rent equipment and explore on your own. Our terrestrial natural reserves are great locations for birdwatching. 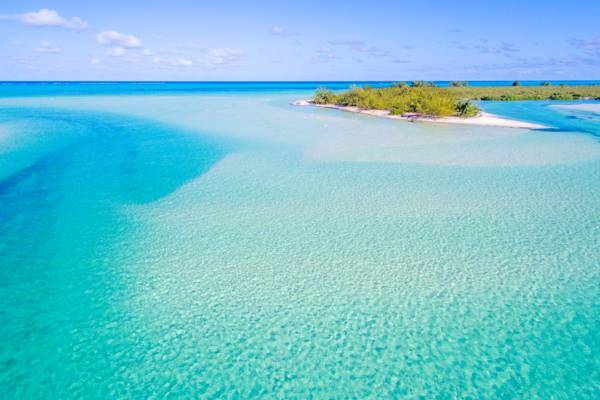 There are several expansive nature reserves and national parks throughout the Turks and Caicos, teeming with egrets, herons, flamingos, pelicans and ospreys. There are almost 200,000 acres of protected area in the country, encompassing an incredible diversity of terrains. 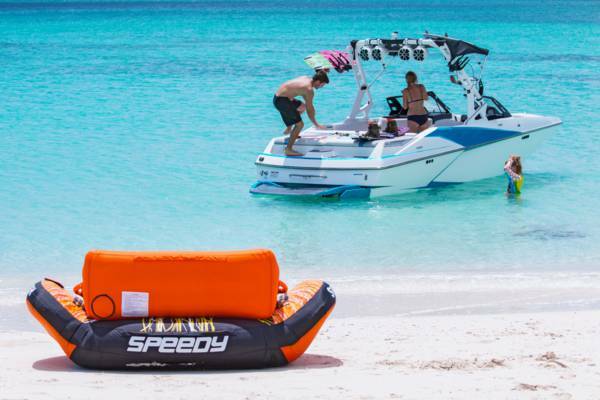 Exploring the exquisite cays of the Turks and Caicos on a tubing charter with Wake to Wake Watersports. The Turks and Caicos is a wonderful kiteboarding destination for all skill levels. If you’re looking to learn, there’s no better spot than Long Bay Beach on Providenciales, where there’s shallow water, perfect wind direction, clean sand, and a safe environment. For the experienced kiter, exploring the uncharted waters and flats of the secluded islands and cays is unforgettable. Several local tour operators also offer kite down-winder safaris – an exhilarating way to see regions of our islands that very few have the opportunity to experience. Although far less consistent than the conditions are at the top surf spots of Barbados and Puerto Rico, the Turks and Caicos does get some beautiful waves at times for surfing. Hobie Cat sailing at Leeward Beach, Providenciales. Although the Turks and Caicos is a relatively small country, there’s quite a difference in development and activity choices across our islands. As the home of the exquisite Grace Bay Beach, Providenciales supports the vast majority of the population and tourism in the Turks and Caicos. Consequently, the islands offers the widest selection of things to do. Grand Turk comes in second, and as a cruise ship destination has quite a few water sports and tour businesses to choose from. The exquisite and tiny stingray haven of Gibbs Cay is found close off the coast of Grand Turk, and offers close-up snorkelling encounters with these friendly creatures. The quiet islands of North Caicos and Middle Caicos offer a different perspective. There’s unparalleled wilderness and plenty to see and do, yet the limited infrastructure means you’ll be heading off the beaten track. The largest mangrove wetlands in the Turks and Caicos are found on the south coasts of these islands, much of which is protected under the international Ramsar Convention. South Caicos and Salt Cay combine historical elements of the old sea salt industry with British-Bermudian Colonial buildings. 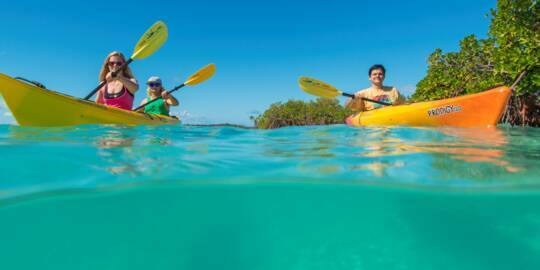 The water sport offerings are a bit limited, yet the reefs, coral and marine life are pristine. Salt Cay is renowned for its winter whale watching, when migrating humpback whales can be seen and snorkelled with. Don’t forget to bring your certifications! Some water sports require proof of appropriate skill before a local business will rent equipment or offer excursions. Examples include scuba diving (minimum of PADI Open Water or equivalent from NAUI, SSI, TDI, SDI, or IANTD) and kiteboarding (IKO or PASA level 3). 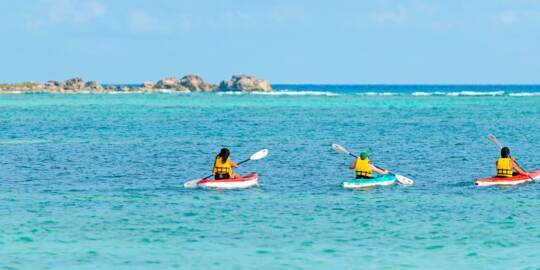 If you’re looking to learn a new water sport or simply hone your skills, it’s hard to do better than the Turks and Caicos. We have professional and certified instructors for almost every water sport, including scuba diving, kiteboarding, windsurfing, wakeboarding, freediving, sailing, swimming and more. Open water swim training at Grace Bay Beach. There are several ways to book your outdoor adventure, including reserving directly with the local tour company and purchasing from a booking agent reseller. Because the local business won’t have to pay commissions, you’ll usually get the best price by booking directly. Many of the resorts and hotels feature onsite concierges, who are able to arrange excursions as well. Activity and accommodation rates vary a bit according to the time of year and corresponding visitor arrivals. The winter months are the " high season", spring break and early summer also experience peaks, and the late summer and early autumn Atlantic hurricane season months see the lowest rates. Cruise visitors to the island of Grand Turk may choose between one of the “shore excursions” sold through the cruise line, or can independently schedule. It’s easier to simply select of the cruise line offerings, yet some water sports such as diving, snorkelling and whale watching will likely be more enjoyable in smaller groups. Keep in mind that the availability of some activities, such as horseback riding, are completely pre-bought by the cruise lines, and it may not be possible to reserve separately. 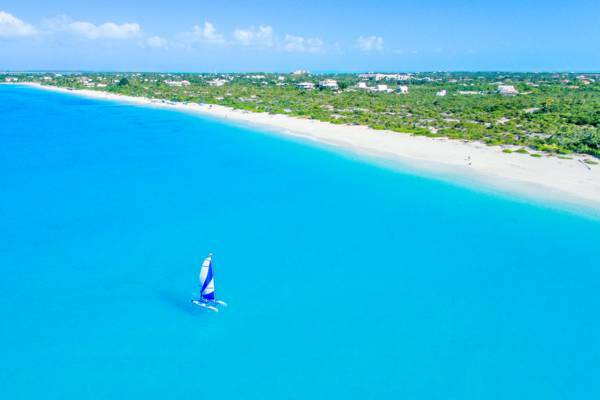 See these pages below for overviews and island by island comparisons of the popular Turks and Caicos water sports. Each of our islands offer a different atmosphere and setting.